Coming up this week on Real Vision: Tian Yang discusses how risk assets have diverged from leading indicators, Larry McDonald sits down with Danny Moses, a new episode of "The Big Story" tackles the fascinating and amusing battleground that is Tesla, and historian Niall Ferguson joins Larry McDonald for a fascinating and wide-ranging discussion. 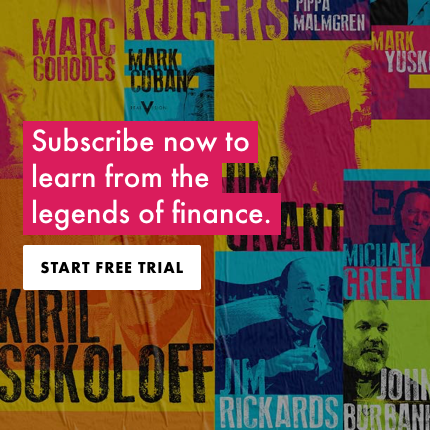 Plus a full slate of “Trade Ideas,” a new episode of "Investment Ideas," and much more. Editor in chief Alex Rosenberg walks viewers through what they can expect to see over the next several days. Now we know where Justine sits. Where's Roger's desk? I don’t see the point of these “coming soon” videos. If it’s ready, get it on Real Vision. We’re subscribers already so why try and tease us? Don’t watch it then. Simple. I find them useful. I like knowing what’s coming up in the week ahead. It would be better in email form which I can scan in 10 seconds rather than a 2 minute video.